When you come to the mission field, you realize there were so many small things in your comfortable American life that you took for granted. I still miss carpet, bathtubs, grits and an air-conditioned house. 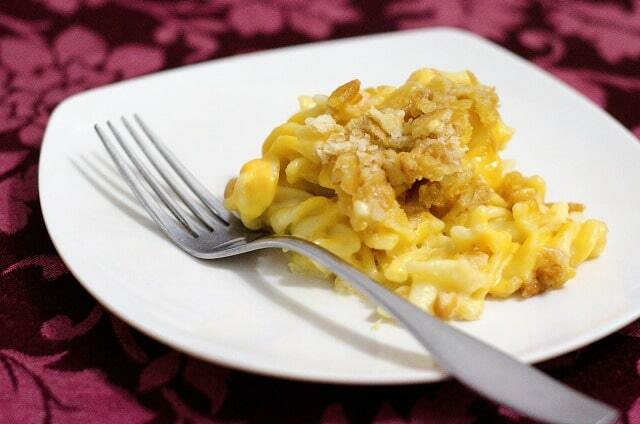 One food item that we missed almost immediately was Southern Baked Macaroni Pie. It’s cheesiness is so fattening, but oh-so-irresistible. I remember during my overly vain teen years that my grandma would chide me about eating this dish because she said I would gain back all the weight I had worked so hard to lose. I wanted to say, “Move over Grandma, you’re blocking the macaroni!” But instead, I just smiled and said, “It’s my off day!” We all have those days, don’t we? Need two reasons to make this super, cheesy dish? Your hubby.Almost every man I know loves this dish, so I can almost guarantee you that you’re hubby will be pleasantly surprised when you place this Southern family recipe dish on the dinner table tonight. Your kids. All kids love macaroni and cheese, right? Well, now you can feel good about feeding them their favorite food because this doesn’t come with the radioactive, orange powder that is suppose to magically transform into cheese. No, I do not believe Kraft’s logo—it’s the cheesiest. I will stick to this recipe that was handed down to me by my grandmother. I don’t believe in keeping family recipes a secret, so here it is! First, preheat oven to 350 degrees Farenheit. Next, lightly grease or spray the bottom of a 10×13 glass baking pan. Then, beat the eggs with the milk until eggs are well-beaten. Now, place half of the macaroni in the bottom of the pan. Then, sprinkle one cup of shredded cheese over the noodles. Next, sprinkle 1/2 teaspoon salt and 1/2 teaspoon pepper over the cheese. Then, sprinkle one tablespoon sugar over the macaroni. Then, cut 1/4 stick of the butter into small squares and scatter across the top of the macaroni. Next, pour half of the egg and milk mixture over the noodles. Then, place remaining macaroni over top and repeat the same layering process. Top it off with crushed Ritz crackers and bake for about 30 minutes or until golden brown. Yields about 8 hearty servings.